Baby hair brushes are made from superior quality super soft nylon bristles which could be safely used on newly born babies. It gently massages the tender scalp while setting your baby's silky soft hair. Durable & convenient. It is packed in multicolour cardboard box and also in a transparent presentable plastic containers. Available in attractive colours to suit every baby kit. Matching up with the ever increasing requirements of the customers, our company is engaged in providing Baby Hair Brush. Babies have a delicate scalp & fine hair right from birth. It is important to remove tangles from their hair as gently & tenderly as possible. Mee Mee Gentle Grip Brush & Comb Set is tender on baby's scalp, easy to carry & use. This set is sure to make baby's grooming more convenient for parents. Especially made for Infants, with superior soft nylon bristles which massages the tender scalp. The brush and comb safe hygiene allow you to gently comb baby's hair. 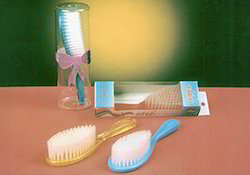 The soft natural bristles of the brush anf the comb teeth with rounded ends are ideal for baby's delicate scalp.